What are the best beaches near Tennessee? And how far is it by car? Evening swim at The Beach Club in Gulf Shores and Orange Beach. This post may contain affiliate links. I receive a small amount of compensation when you purchase from my links which allows me to continue my waffle fries addiction. You can stop searching the Googler for: closest beaches to Nashville, because we’re here with the answers. What’s the closest ocean beach to Nashville, TN? The view from the Beach Club at Gulf Shores, AL. Pensacola and other beaches on 30A (like Seaside and Rosemary Beach) are 6 hour and 48 minutes away. Destin and Gulf Shores is about 7 hours away. Panama City Beach is about 7 hours and 15 min. Tybee Island and Hilton Head beaches are about 7.5 hours away. Myrtle Beach is 9 hours away. One of the best beaches is: Gulf Shores and Orange Beach, Alabama. From your driveway in Nashville to the emerald waters of Gulf Shores and Orange Beach, the drive time should be 7 hours. Sunset on the shoreline of Gulf Shores and Orange Beach. The trip down South from Nashville to Gulf Shores is a straight shot on I-65 south AND you get to pass some GREAT sights along the way. Stop and sightsee (HERE) on your way down to the beach. Visit the city’s Lowe Mill Arts and Entertainment Center. Want an educational stop? Try Burritt on the Mountain Museum (open air history museum). Don’t miss the Birmingham Civil Rights Institute. Take a walk through the Birmingham Zoo. Want an educational stop? Try McWane Science Center. The kids will love Gator Alley Boardwalk. Have lunch on the water at Shux Pier. Stroll through the Fairhope shopping and arts area downtown. So, here’s my advice: pin this article so that when you have that hankering for a beach getaway from Nashville, EVERYTHING you need to make your plans is right here. If you want a party beach, Gulf Shores and Orange Beach may not be your spot. Don’t get me wrong. Gulf Shores knows how to have fun with big festivals like this or unique events like this one that that you won't find anywhere else in the world! I mean, when can you see bull riding ON THE BEACH!? In Gulf Shores, you can. While there's no lack of entertainment, the Gulf Shores community is proud of the efforts to keep their beaches family-friendly. One of the ways they do that is to ban alcohol on the beaches during spring break season. Bulls on the Beach, an annual event at the Florabama that happens only in Gulf Shores! It’s not a fancy beach; you won’t have to sell a kidney to vacation here. Now, I’m not saying there aren’t exclusive spots in Gulf Shores like Perdido Key Resort, this full-service resort or these condos with grills and jacuzzis on every balcony! But on the pretentiousness meter, Gulf Shores flatlines, and that’s a GOOD thing. It’s no wonder that they were voted by USA Today as one of the Best Southern Beaches. It's a well-rounded location with options for everyone. Those Crazy Nelsons enjoying a beautiful beachfront meal at the highly-rated Voyagers at the Perdido Key Resort. What we love about this city is its coastal charm, with its family-owned stores and restaurants, and its controlled development. When you drive along the sea, your view of the ocean is not completely blocked by a million skyscrapers, as it is in other popular beach towns. Schedule your beach activities ahead of time here -> Try parasailing, dolphin cruises, and THESE other activities! 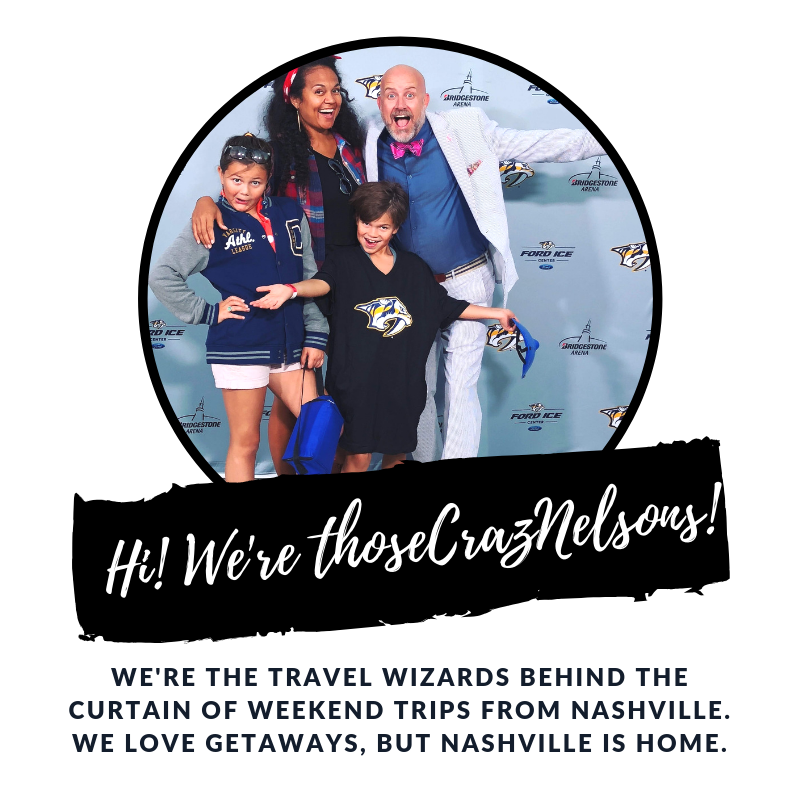 Weekend Trips From Nashville is a local travel tribe hosted by Those Crazy Nelsons. For all the best weekend trips, connect with us on FB! Here are the things to do in Gulf Shores for every kind of getaway! Our friends at Gulf Shores have recommendations for each type of trip! For details on where to eat and what to do, click on the type of getaway you’re planning. It's you and the kids! What should you do as a family? The adventures are almost too many to list. Here's the tip of the iceberg here. Get away from it all with your besties!! All the fun is listed here. Reconnect and discover what it's like to be friends again. Your romantic details are here. Let the bromance begin! View all the manly details here. When is the BEST time to go to Gulf Shores? We tend to think of the beach only during the summer months. But one of the tricks of the travel trade is finding those "off season" trips! They are less busy, less expensive, and more bang for your buck. Take a look at the video below and imagine doing all of this for half the price -- in October! The best thing about our gulf coast beaches is this: summer goes WAYYYY past August each year. Basically you can plan for a summer AND a fall beach getaway every year! Lakes or beaches? Which do you prefer? In Tennessee, we’re fortunate to have many options for lake fun! And we have quite a variety of man-made beach areas around town, like this one. But, it’s not the same, right? So, here’s my advice: pin this article so that when you have that hankering for a beach getaway, EVERYTHING you need to make your plan is right here. Sign up with your email address to receive one Mystery Road Trip EVERY Friday. That’s 52 new road trip ideas in a year. You won’t ever wonder WHERE to go! Thank you! Be on the lookout THIS Friday for your new road trip! How much does a beach trip cost during off-season? These are the must-see activities on your next trip to Gulf Shores!